With my maternal grandfather having been born in Myanmar (Burma) and living there until he got to school age, I always felt a part of me felt a connection to the country. After spending a little over a week in the South East Asian nation recently I've discovered what part that is – my feet. In Burma, everything seems to be done wearing thongs, or flip flops, sandals, jandals, slides, slippers or whatever it is you call them in your part of the world. I'll admit I went for a bit of an attention grabbing headline, but in Australia we call them thongs. I've always been a fan of the “less is more” style of a humble set of thongs. Wearing them around back home doesn't raise an eyebrow (unless you're trying to get into a pub, what's with that? ), but I've been known to wear them to the corner shop when I lived in Vancouver, Canada in Winter, even with snow on the ground. So when I saw every person around me wearing my favourite kind of footwear, I felt like I was home. The simple bits of rubber sole held together by a couple of rubber straps are the footwear of choice for virtually everyone in Burma. Their spiritual leaders, the Buddhist Monks wear them. 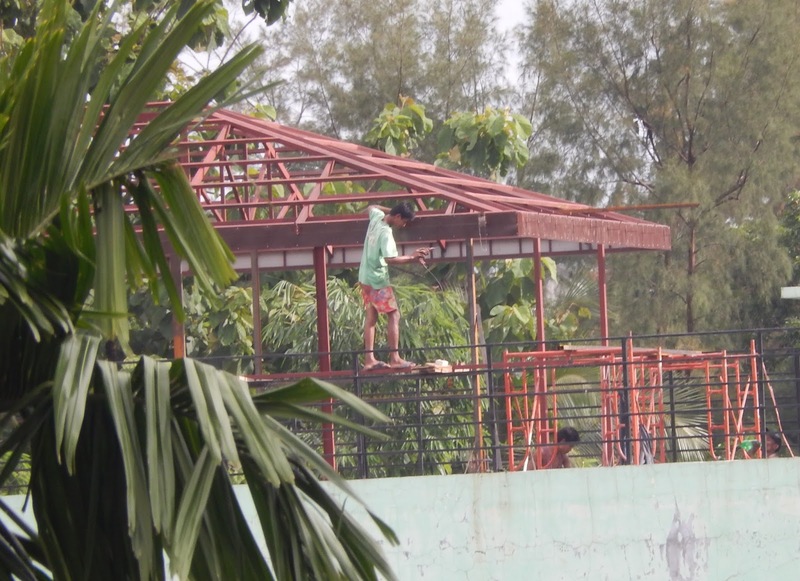 Guys working on construction sights wear them, and motorbike taxi drivers wear them. I was actually genuinely surprised to not see the police walking around in the ubiquitous double pluggers. It is easy to see why these are the shoes of choice too. Particularly at this time of year its very hot, very wet and the streets quite dirty. Your feet will get wet. And yet because of the heat, the moment you're out of the water your feet and thongs will dry. Tell me those fancy hiking boots will do the same. Another reason for the choice of footwear that when you visit any of the many pagodas, temples and other historic sights, you're expected to take off your shoes. As one of my travel companions found out, if you're wearing shoes and socks, this can cause some delays in your sight seeing as there are a lot of temples to see. Even visiting the Strand Hotel – a fancy landmark popular with expats, diplomats and ambassadors – wearing thongs is considered normal. I'd like to think Australia could learn from this! Figured it would be a good time to retire the old Havaianas! While there is far more to Myanmar than just their choice of footwear – and I'll get into that more in the next blog – it was good to see that I do have something in common with the people for whom my family has some history. Are Burmese the friendliest people on earth?